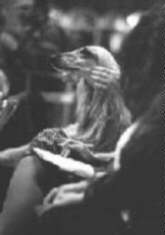 Afghan Hound Times -Afghan Hound Club Of America Speciality 1997 Virginia Beach (Photographs by Rose Marston). more fun in the surf?? to be out walking his flock on the beach! Madelaine (Ch Qamari's Carnival Colors) gets interviewed by local television after showing. Her handler (left) Lucia Brown interprets for her. OK tell me again, Dad, when can I go back in the ring?? Not just another pretty face in the crowd! Not everyone watches the competition!